In the late nineteenth century, as cities like Boston and New York grew more congested, the streets became clogged with plodding, horse-drawn carts. When the great blizzard of 1888 crippled the entire northeast, a solution had to be found. Two brothers from one of the nation's great families—Henry Melville Whitney of Boston and William Collins Whitney of New York—pursued the dream of his city digging America's first subway, and the great race was on. 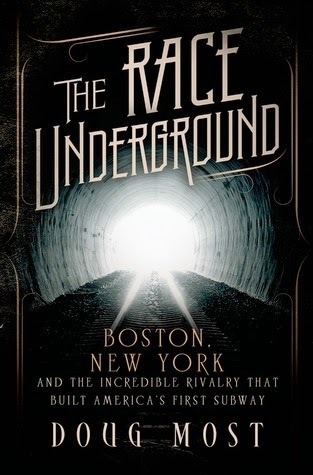 The competition between Boston and New York played out in an era not unlike our own, one of economic upheaval, life-changing innovations, class warfare, bitter political tensions, and the question of America’s place in the world.The Race Underground is peopled with the famous, like Boss Tweed, Grover Cleveland and Thomas Edison, and the not-so-famous, from brilliant engineers to the countless "sandhogs" who shoveled, hoisted　and blasted their way into the earth’s crust, sometimes losing their lives in the construction of　the tunnels. Doug Most chronicles the science of the subway, looks at the centuries of　fears people overcame about traveling underground and tells a story as exciting as any ever ripped from the pages of U.S. history. The Race Underground is a great American saga of two rival American cities, their rich, powerful and sometimes corrupt interests, and an invention that changed the lives of millions. It was a time of change and innovation for the United States. Many inventors were rushing to have their creations patented and entrepreneurship seemed to be the trend of the times. With so much happening and exciting times ahead, the United States was growing at a magnificent rate. Two major cities felt the weight of this growth the most. These were the cities of Boston and New York. The streets were riddled with people and horse-drawn carriages and were nearly bursting at the seams. Traveling the streets was treacherous, often with the choice of standing or running for your life. Two brothers, one in Boston and one in New York, recognized that the growth of their city would not soon end and set out to relieve the crowded streets. In this novel, Doug Most takes the reader on an adventure filled with frustrations, heartbreak, devastation, political wars, defeats and championship. If Mr. Most had been my instructor during my school years, perhaps history would have appealed to me. The author brings history to life with insights in to the feelings of the men who were filled with passion and urgency to bring a subway to their towns. He give life to all of the characters, from the workers who spent many tedious hours chipping away at the underground tunnels to the corporate giants who provided funding. I found this book surprisingly fascinating. Doug Most displays an excellent writing style which made the book nearly seamless as it changed to different years and characters. The book has, obviously, been thoroughly researched, which paves a way for the reader to feel as though they have been plopped right down in the middle of the late 1800s to early 1900s. I not only enjoyed the story, I learned quite a bit about the history of the United States from a unique standpoint. This was a story of hard times, of frustrations and crushing disappointments. It was a victory and a tragedy rolled into one. Mostly, it was a fantastic tale of perseverance and believing in our dreams. I would recommend this book to anyone with even a slight interest in the building of capital America and the sheer genius of the human mind. Is this a novel or nonfiction? It sounds really interesting! Hi Lisa! It's non-fiction :) Thanks for visiting! !